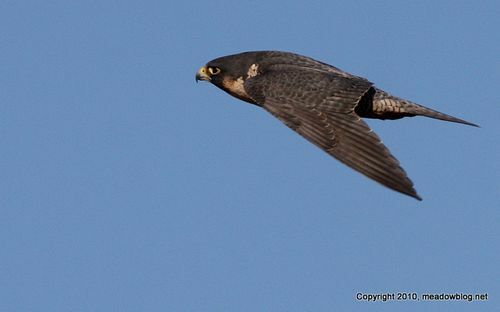 Start the new year right with some fresh air and new birds (for your 2011 list)! Join us on our next free guided walk on Sunday, Jan. 2, at 10 a.m. at DeKorte Park. 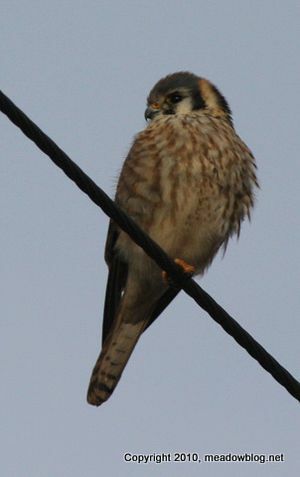 The walk is brought to you by the New Jersey Meadowlands Commission and the Bergen County Audubon Society. Who knows? Maybe the Long-tailed Duck will make an appearance. 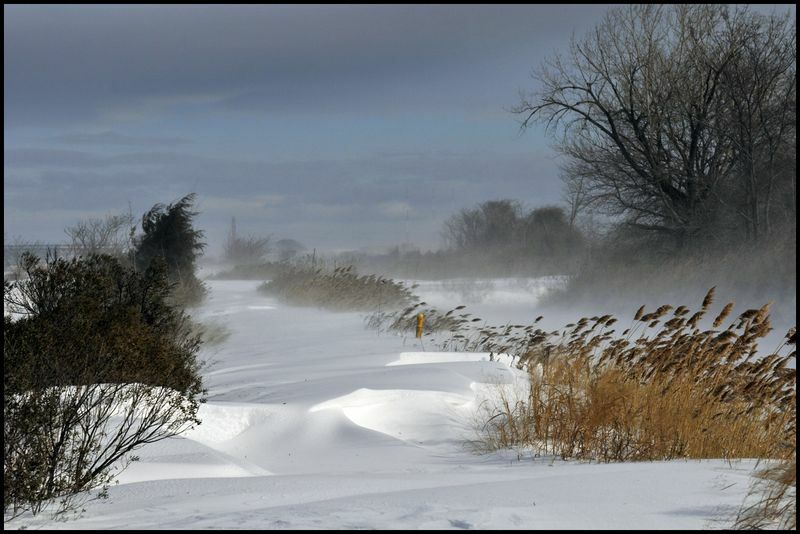 Dress warmly — it is winter in the Meadowlands. Full info on the walk follows. Check this blog for weather-related cancellations. The New Jersey Meadowlands Commission’s Flyway Gallery will continue to host an exhibit of watercolors and pastels by local artist Mark de Mos and his students through January. The show, “Mark de Mos and Friends,” runs to Jan. 28. The exhibit features works by De Mos (above) and his students – Anita Adelman, Keiko Matsuura, Tomoko Sugihara, Myrle Scott, Dottie Glen, Jane Stein, Erola Pellegrino and Joy Xie. 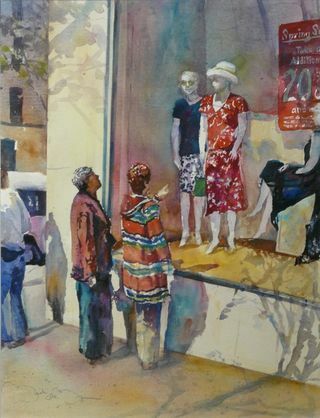 De Mos is a member of several art associations, including the Allied Artists of America, the New Jersey Pastel Society and the Essex Watercolor Society. Two more paintings, plus more info, follow. Walking through marshes and snooping around landfills for 11 hours may not be everyone’s favorite way to spend a December Sunday, but it has its rewards. 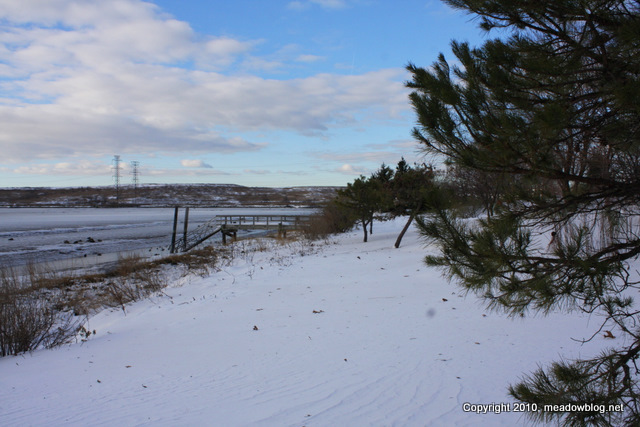 Last week, I participated in my third Christmas Bird Count in the Meadowlands, and I saw all sorts of amazing birds. 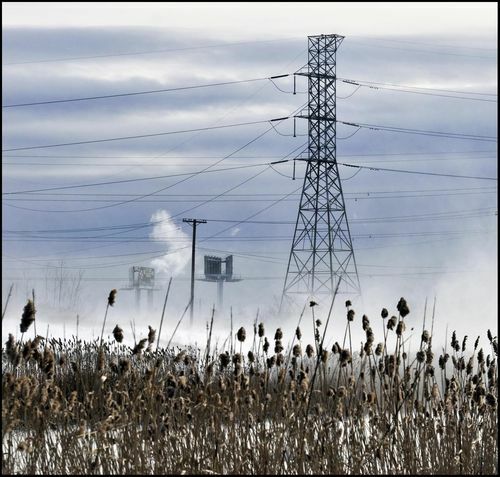 They ranged from a Common Raven perched on a pole on Chubb Avenue in Lyndhurst to bald eagles all over — in a Carlstadt marsh, a DeKorte Park electrical transmission tower, and a North Arlington landfill. 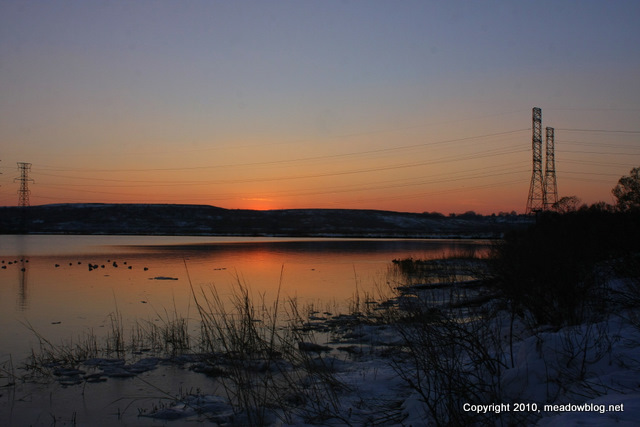 The Meadowlands Commission’s team of six, split into two groups, covered most of the major birding areas in the district west of the Hackensack River. 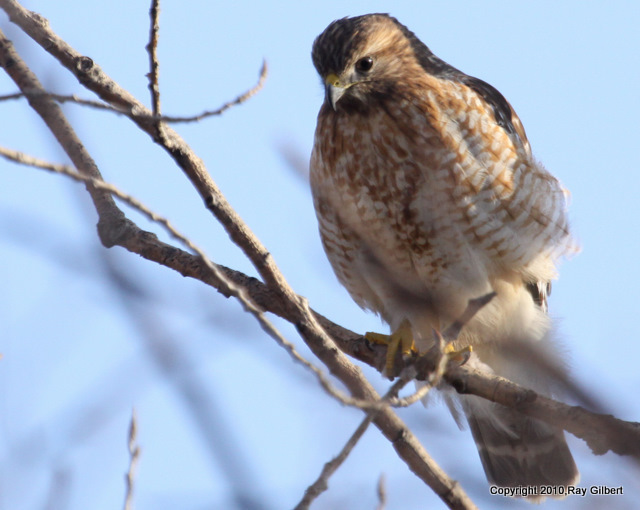 We were once again reminded of how many great birds the 30.4-square-mile district attracts – even in winter, a time when folks tend to think most birds have headed south for some R & R.
Ray Gilbert photographed this Red-shouldered Hawk on Disposal Road on Wednesday afternoon. Good to see Disposal Road rounding into winter form. Sunset from last Wednesday is here. Don’t Forget: Find a Rare Bird, Win an Eco-Cruise for Two! With his confirmed sighting of a Rough-legged Hawk this morning, raptor whiz Mike Britt is on his way to winning two tickets for an NJMC pontoon boat eco-cruise on the Hackensack River and adjacents marshes next summer. The blog post with the contest rules is here. A few earlier posts on Rough-legged Hawks are here. 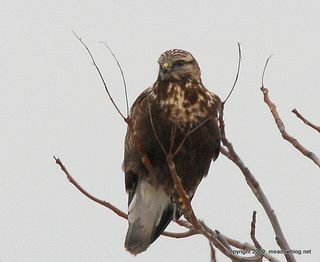 At around 8 a.m. today, I observed two newly arrived Rough-legged Hawks (both light morph) at Mill Creek Point in Secaucus. Both birds hover-hunted over the MRI tract across the river and one was kind enough to cross the river and hover-hunt over the Secaucus High School Marsh…awesome looks from the raised walkway. Both birds were perched on small trees, across the river when I left. 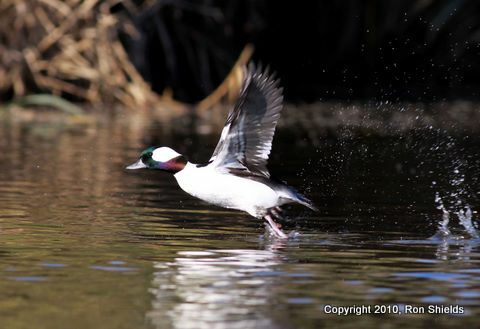 And one at Kearny Marsh (on the jump). Thanks, Marco!